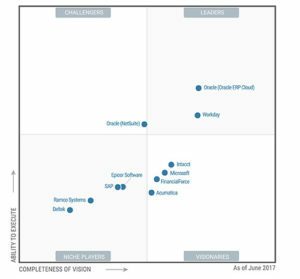 ORACLE ERP CLOUD IS LEADER FOR GARTNER! A few days ago, Gartner published the report “Magic Quadrant for Cloud Core Financial Management Suites for Midsize, Large and Global Enterprises”, which compares the different Suites of Cloud for applications for financial management taking into consideration also the different company sizes (medium, big and global). Gartner is one of the world’s leading companies in the IT world that deals with product/market analysis and research in order to support strategic customer decisions through specific consultations and reports capable of delivering an unbiased point of view on a product, a company or the market in general. The “Magic Quadrant” identified by Gartner is a tool easy to interpret and to understand, that allows you to immediately identify market players, and then adds a much more detailed report explaining the different motivations that have led to this specific positioning. What emerges from the report is that the market is changing very fast: in the last 12 to 18 months there has been a clear abandonment of staticity due to the increasing availability of Cloud applications which results in the loss of appeal of traditional solutions and the consequent boom of companies that decide to adopt cloud-based solutions. Oracle not only reconfirms its presence within the market, but the Oracle ERP Cloud Suite of financial management software is even recognized as a market leader. These solutions, adaptable to any business regardless of its size, allow you to optimize your business processes by increasing productivity, reducing risks and consequently also costs, improving revenue management, and granting an accurate and timely project management.